Precious metals futures on Monday settled lower for a third straight session. Gold registered its lowest price in five weeks while silver closed at a more than three-week low. Gold for April delivery declined $1.50, or 0.1%, to close at $1,220.10 an ounce on the Comex division of the New York Mercantile Exchange. The settlement was the weakest since Feb. 22 when gold ended at $1,210.10 an ounce. "Less risk aversion in the marketplace to start the trading week is a negative for safe-haven gold," Jim Wyckoff, a senior analyst at Kitco Metals Inc., said in a daily note. "Also, the recent selling pressure in gold has invited chart-based selling from the shorter-term futures traders." 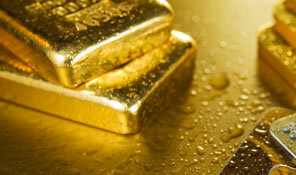 Gold prices traded from a low of $1,206 to a high of $1,223.20. They fell last week by 2.6%, their third weekly loss in a row. Silver for May delivery dipped 0.9 cents, or less than 0.1%, to settle at $15.190 an ounce. The settlement was the lowest since March 3 when the precious metal ended at $15.146 an ounce. Silver prices ranged from $15.14 to $15.38. They gave back 3.9% last week. April platinum fell $7.70, or 0.8%, to $944.70 an ounce, trading between $939.20 and $956.30. Palladium for June delivery shed $5.65, or 1%, to $567 an ounce, ranging from $566 to $584.55. Last week, platinum dropped 1.9% and palladium dived 3%. Last week, they posted losses of 2.5% for gold, 4.1% for silver, 1.5% for platinum and 2.7% for palladium. United States Mint bullion sales were unchanged. Earlier on Monday, the U.S. Mint announced a sales limit of 1 million American Silver Eagles for this week, matching the last several weekly levels. The Silver Eagle’s cumulative sales total for this year is at 14 million coins, or 22.1% higher than through the same time in record year 2015. Forget precious metals for now! Get the 2016 America’s Founding Fathers currency set from the BEP tomorrow morning first day of issue. Very limited edition of 5,000 sets only! Order early banknote collectors.